A simple and hearty dish that is perfect for weekday nights and chilly winter evenings. Potatoes, garlic, and milk are cooked into a delightfully delicious pie that is as simple to make as it is delicious. Serve with roasted vegetables or alongside steak for an unforgettable meal. Preheat your oven to 375°F (180°C). Butter a 9" pie plate and set aside. Slice potatoes thinly. Place a thin layer of potatoes in the pie plate. Add a layer of garlic, Parmesan and butter. Repeat until the potatoes are all used up. Reserve a small amount of butter and Parmesan cheese and set aside. In medium saucepan heat milk (but do not bring to a boil) and gently pour over the potato pie. Top with breadcrumbs and remaining cheese and butter. 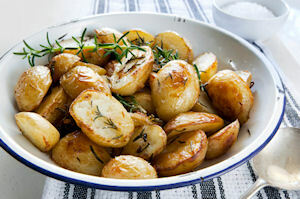 Bake for 1 hour, until the potatoes are tender and top has turned golden brown. This is excellent. Will keep it as the "other" escalloped potato recipe. Yummy! Made as directed, next time will kick it up a little, maybe cheddar cheese too? Who knows! I think anything will be good to add to this recipe! Really easy and delicious potato recipe. Was a great compliment to the balsamic chicken I made tonight! Summary: A simple and hearty dish that is perfect for weekday nights and chilly winter evenings. Potatoes, garlic, and milk are cooked into a delightfully delicious pie that is as simple to make as it is delicious. Serve with roasted vegetables or alongside steak for an unforgettable meal.